CosmoBC.com » HomeBlog » Bathroom » How Can A Professional Bathroom Remodeling Prove Beneficial For Your Home? A bathroom is a homeowner’s object of style and substance. That should be quite attractive to uphold a bathroom experience that is pleasant yet useful enough for justifying a splurge on design or a complete overhaul. The bathroom is a highly visited place next to the bedroom and living room. So, why not consider a professional bathroom remodeling to augment the existing condition of the bathroom. It is a challenge yet there are a couple of perks in the store of undertaking this project. 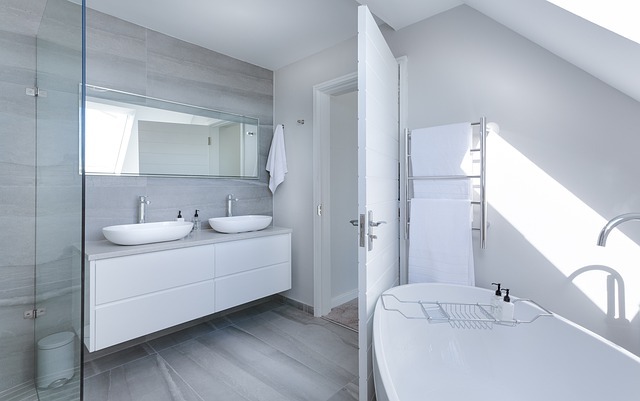 No matter you are remodeling the bathroom, adding an en suite or renovating, take into consideration the factors which will make the room relaxing and comfortable and most importantly functional. Replacing the old tub with that of something spa-like will be a great choice. Using a tiled shower having multiple showerheads, using materials and colors which will make you serene and calm will work wonders. Here a bathroom remodeling expert can help. By now you should be aware of the fact that any home buyer while buying a home will be more interested in the bathroom and the kitchen. Merely improving the surface aesthetics such as updating the faucets, tub surround, new countertops or giving it a fresh paint can work wonders in attracting prospective customers and also augmenting the resale value. A professional can help you in renovating the bathroom within a budget. To buy fixtures that are energy efficient such as shower heads and low-flow toilets has turned highly cost-effective these days. Should you be worried about losing the water pressure, in fact, the difference which you will see among the older products with the latest energy efficient products will be subtle and barely noticeable. A professional will swap out the old lights with LED lights that are energy efficient. These green upgrades along with reducing the environmental impact will also at the same time save money on the monthly utility bills. You will be taken aback by how wonderfully the newly renovated bathroom looks. Rather than walking in as well as feeling annoyed through dated fixtures and countertops, you can take pleasure of the bathroom’s appearance and functionality both. The look is not the be all and end all of everything but will help you in enjoying the home more. If you feel cramped in the bathroom, then it is time to go for a bathroom remodel. A well-planned bathroom design will ensure that the toilet has sufficient space. The professional can add space to the bathroom through significant reconstruction and renovate or do so by using layouts that are appropriately designed using fixtures which will fit better. Be it swapping the extra vanity for a better streamline or adding extra storage within creative places. A bathroom remodeling expert can aid you in creating a bathroom which will work finest for your requirements. At the time of remodeling the bathroom, some luxuries of the modern age can be added thereby making this room more functional, enjoyable and attractive. Today there are countless innovations when it comes to lighting, cabinets, shower, toilets, and sinks. The icing on the cake is you can watch a favorite television series while comfortably sitting in a Jacuzzi or take pleasure of a toilet seat that is warm during the chilly winter nights. In short, the possibilities here are endless. It is good, to be honest. To wake up in the morning and stepping into a bathroom that is rundown will kill your mood. Here upgrading the bathroom into something that is modern can help because it will increase happiness instantly. Besides when having family and friends over the home an attractive and nice bathroom undoubtedly will make you confident regarding space which you reside in. Changing the shower doors, shower, vanity, tiles, cabinets, and fixtures will give a new look and lift to the bathroom. While selecting a bathroom makeover, it is vital to take the help of a professional plumber such as the best Santa Cruz plumber. Along with helping with the bathroom design, fixture desires, and materials they can also guide you on the other necessary changes if the need be. No matter you wish to stay in the house indefinitely or plan to sell it, remodeling it will offer you the chance of installing safety features like non-skid surfaces, shower benches, and handrails within the area surrounding the tub/shower. With a lot of contemporary styles available in the current market homeowners of every age is selecting to install the same. Should you plan in accommodating a senior citizen in the future, use a higher toilet and a shower door that is wider. It pays in addressing for such requirements in a complete remake instead of retrofitting it later. Renovations or remodeling can incorporate the latest water saving methods which can help in reducing the consumption of water and ultimately the water bill. To install a new toilet and shower head which utilizes such options will be worth considering in the remodel. Such features will appeal to the buyers that are energy-conscious when it is time for selling the home. Bathroom remodeling is a task that is immensely critical and for this specific skill is needed. The right way will be by entrusting a professional for handling the waterproofing and bathroom renovations. You can enjoy peace of mind as the experts are there for carrying out the task in its entirety and accurately. A skilled plumber for sure will not create any errors in the renovation for which the professional has been hired. Being experienced and highly trained will not leave scope for any forms of complaints. Take recommendations from relatives and friends while hiring a reputed plumber. It is not a simple job which just anyone can undertake. Here a lot of skills and training is needed for the same. Hire the best and breathe a sigh of relief.